Say goodbye to generic emails—and to flaky, fussy template editing tools. Whether your messages need just a little customization or are completely data-driven, SparkPost’s email templates give you the flexibility to programmatically tailor each message at the individual recipient or list level. Our powerful and adaptable template language gives you total control. We’ve all used in-browser, point-and-click editors that are time-consuming, tediously repetitive, and even unpredictably quirky. That’s why SparkPost’s template system lets you add personalization, business logic, and dynamically generated content to every message you send in a programmatically effective way. Create, manage, and control templates via API or UI. Template rules and data can be as sophisticated as you need. All template features are fully accessible to programmatic control. Our powerful and adaptable template language gives you total control over message generation logic, with rules and data as sophisticated as you need. Templates support substitution variables and dynamic content in all parts of the email—headers, HTML, and text. Configure default values if substitution data is absent. Define nested substitution rules to go beyond simple variable substitution. Build sophisticated logic with full conditionals like if, then, else, elseif, and more, or loop over JSON arrays using each. If your business processes are truly data-driven, SparkPost’s API-driven template system gives you unlimited flexibility to let your business logic control your email messaging. 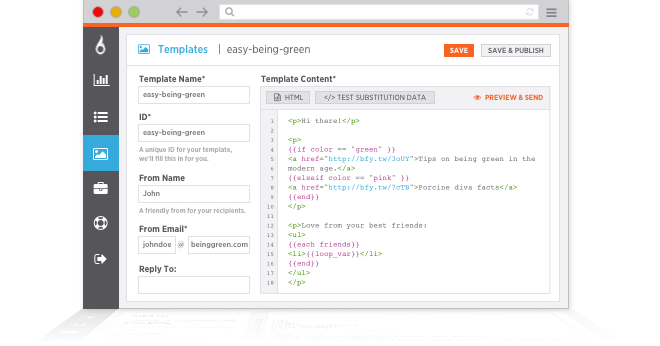 Extend the capabilities of your email template with the SparkPost API. Generate messages that reflect all the advanced functionality of external applications and services. Developers will feel right at home with our template language, and SparkPost’s familiar syntax style helps your team hit the ground running. And if you’ve developed custom email templates on other platforms like Mandrill, we make it easy to leverage your work and investment. Familiar handlebars-style syntax based on sit2. Automated template conversion tools to pull existing templates into SparkPost from other services. If your enterprise has chosen SparkPost’s Premium or Enterprise add-on plans, our email pros will help your email team make the most of email templates. Technical Account Managers (TAMs) deliver template best practices and help you integrate business logic. Build your knowledge and explore email best practices with SparkPost’s email template resources. Once you understand how to send an email, you'll want to know how to create templates in SparkPost. Here’s how. A great email template is the skeleton that gives you the structure you need to focus on what matters. Here are the must-haves for any email template. Here’s how to use our open-source Mandrill template migration tool. It makes it easy to import Mandrill templates into SparkPost. Learn why onboarding messages, notifications, password resets, and other types of emails are critical to the customer lifecycle. Access our latest report now.